Weddings in Vermont are beautiful; at the Inn at the Round Barn, they are simply magical. Find ideas about adding special touches to your wedding. You will also find a selection of the top wedding vendors in VT. Wedding cakes have changed dramatically over the past few years; no longer are couples limited to basic flavors and styles. Each layer can be a different flavor and colors are up to you - the possibilities are endless! Some couples opt for a less traditional approach by offering cupcake displays, pies, or a small cake for the cutting paired with a bountiful assortment of sweet treats for the guests. Other wedding treats that guest have enjoyed are cupcakes, old-fashioned fruit pies, dessert displays, and ice cream sundae bars - Ben & Jerry's mini Sundaes are also an option. It's best if the cake is delivered and set on the cake table before guests are expected to transition into the upper Hayloft level of the Round Barn. Your event coordinator will be happy to arrange this with the baker for your convenience. Also, let us know if you are bringing a personalized cake knife and server. We will ensure that they are prepared for you to take home by the time of your departure. You are welcome to use our knife and server if you prefer. Sweet Simone's is all settled into their new headquarters in nearby Richmond. 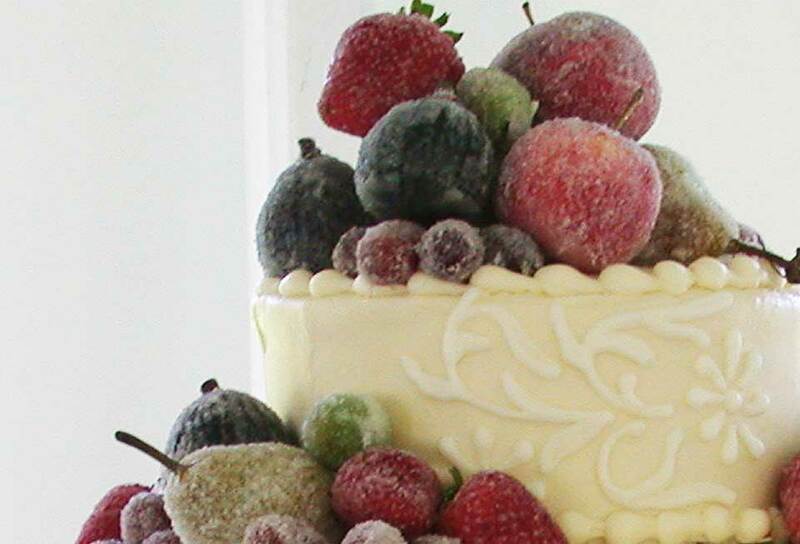 For a creative twist on traditional wedding cake, try Lisa’s coconut cake or cupcakes. Absolutely delicious! At Vermont Cake Studio their goal is to create a delicious and unique work of art that will be the Centerpiece of your Celebration. Chef Perrin meets with each couple to custom design your cake. 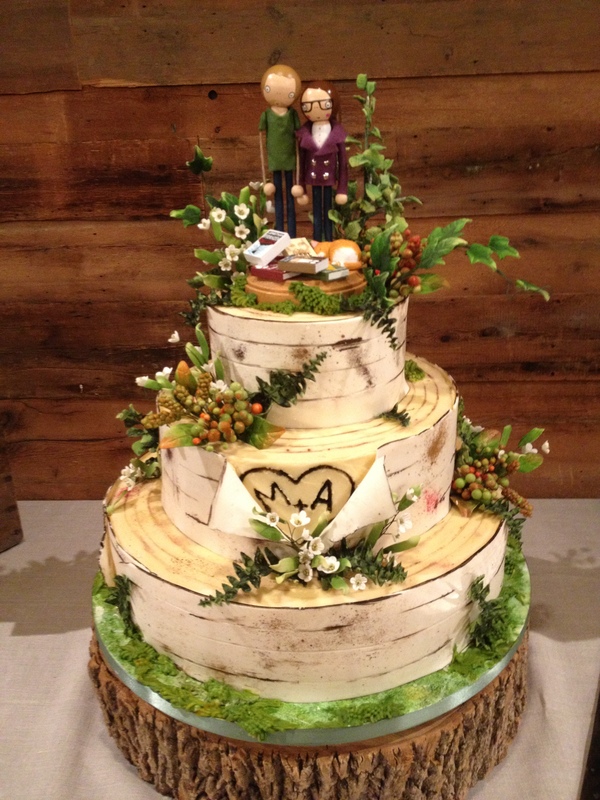 Marion makes a birch tree cake that looks so real, you'll barely believe it's edible. These decadent cakes will have your guests coming back for second helpings! Mix wants to be at your wedding! Every detail of your wedding is important to them. They bake, decorate, deliver, and set up. Many musical options are available to you both locally and from surrounding areas. This list recommends groups that we have enjoyed the most. Prices for live bands generally run between $1,500 ~ $5,000 for a 4 hour contract. Most Disc Jockeys range from $800 ~ $1,200 for 5 hours. A melodious addition to your ceremony and/or cocktail hour. Peter Fairbanks Miller - Violinist - (802)644.5708 Peter is alluring as a strolling violinist, and really works the crowd during cocktails! Irish penny whistle, standup bass, guitar, mandolin, fiddle and vocals create their toe tapping, head bobbing, gotta move tunes! Local Valley band. We welcome your own personal choice of music, but do require that any amplified music end by 9:30pm during summer, and 11:00pm in the wintertime if you have rented the entire Inn. It is mandatory that a copy of the musician contract(s) be mailed or faxed prior to your signature. By sending this ahead of time we can ensure that the staging, electrical, meal and set-up requirements can be met. We will also be in contact with your musicians prior to the day of your event to insure correct arrival times and expectations. The Grift is not your average wedding band. They have the versatility and musical chops to pull off a wide range of styles, all the while delivering a high-energy performance that keeps the dance floor packed! They flow effortlessly from covers of The Doobie Brothers to Prince to Def Leppard and Journey, while maintaining a level of professionalism that makes them one of the best bands in the business to work with. We added this band to our list in 2008 because we were so blown away by their performance. Their ensemble with Monica & Bryan had even the staff dancing! This band has been one of our favorites for many years now. Great oldies from the 60’s thru 90’s with a fantastic female vocalist. The High Rollers are booked through Best Bands listed under the Booking Agents section. Here is a very popular local band that always gets people dancing. An ever-changing group of some of Vermont’s best consummate musicians, with instruments ranging from keyboards to horns. The play mostly jazz, funk, and transfusion, and can do a dinner music trio, and/or ceremony music as well. Honky-tonk and Rockin’billy music - get ready to kick up your dancing shoes and do the Lindy! Professional DJs with Formal Attire, Full Backup Systems and Positive Reviews. Professional DJ’s for every event, dressed in tuxedos. Whatever your taste in music may be, WDJVT will work with you to achieve the best possible musical experience for your special day at an affordable rate. A booking agent is the middle man between you and the musicians. They represent a large roster of talent, and will help you find appropriate musicians for your event. A booking agent will normally take a percentage of the band's guaranteed fee, so there shouldn't be an up-front charge to work through an agency. They, too, will have Disc Jockey lists. Best Bands - Great website showcasing numerous Vermont musicians. Hans has had years of experience with the Round Barn facility and many of our clients. He books The High Rollers, Phil Abair Band, Grippo Funk Band and many more. Visit his website and contact Hans; he will hook you up with demo CD’s to listen to at home. One of the most popular locations at the Round Barn for an outdoor ceremony is known as “The Willows”. Large willow trees, rocks, and the pond compose the beautiful, natural backdrop. You may want to enhance the ceremony area with two simple arrangements that can later be placed inside on the wagon, food stations or ramp leading into the barn. We also have a variety of other beautiful locations for your outdoor ceremony. If you choose to have a unity candle, it is recommended that you purchase hurricane glass to place around it. 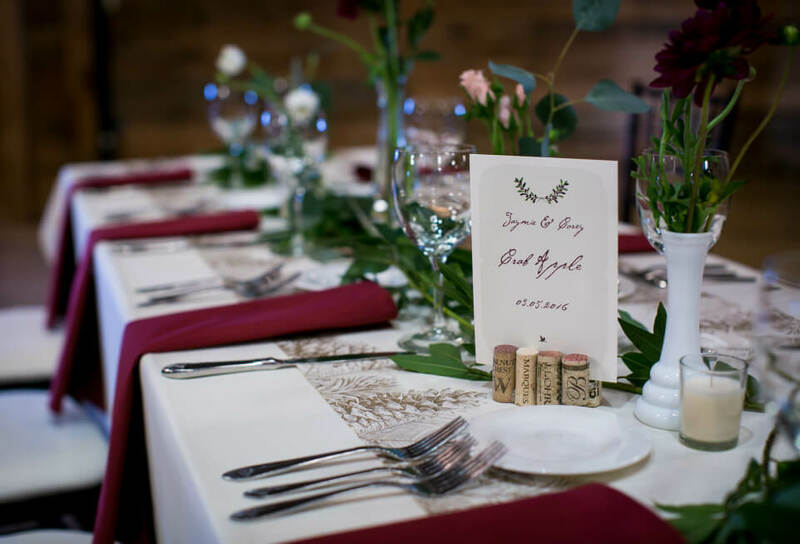 For winter ceremonies and inclement weather days, we will have your wedding ceremony in the middle level of the Round Barn, known as the Milking Parlor. Up to 175 chairs can be set up for your guests. An aisle will be created and your florist can creatively adorn the parlor's simple, white-wash walled room. Personal flowers for the couple, the wedding party, family, and honored guests are a lovely touch. Your florist will be pleased craft a beautiful floral plan for you. We will assemble a variety of tables for the cocktail hour, which can be decorated with small florals or themed items that can later be moved to the reception area. We also have a variety of key locations for extra flowers and arrangements. Our culinary team will decorate individual food platters and the serving tables, if you wish. The upper level of the Round Barn, known as the Hayloft, is naturally beautiful due to its architecture. Simple and elaborate centerpieces alike work well in this room. When choosing your centerpieces, keep in mind the other items that will be on the table, i.e. menus, place cards, favors, silverware, table numbers, and glassware. Also, don’t forget your guests will take up space while they dine! Our round dinner tables are 5 feet in diameter, and seat 8 guests comfortably. Bear in mind that as you make table assignments, you will have some tables of 7, some of 8 and possibly 9 or 10 depending on how your groups are divided. All flames must be enclosed in glass. Unity, votive, or hurricane glasses can be provided by your florist. Bathrooms, balcony railing, entrance railing, barn entrance, and wreaths for barn doors. Lanterns or luminaries for the walk ways later in the evening. Make sure that you or your florist has forwarded the contract to the Round Barn for approval. You should know how many food tables you have in total, including guest and food service tables, and if you can make adjustments once the final numbers are in. In order to preserve our place in the National Historic Registry, no new holes are allowed in the wood; i.e. absolutely no tacks, staples or nails. We ask that you use existing nails or be creative with string and tape. Be sure to let your Event Planner know if you would like guests to take centerpieces. Your florist will also need to provide a “return list”. We are happy to donate the extra flowers to local facilities if you like. Our personal favorite is Hope Lodge in Burlington. A local member of Vermont Association of Wedding Planners, Nancy Murray’s designs have been described as “Naturally Romantic, Simply Elegant and Purely Magical”. Nancy is very familiar with the Round Barn and will thoughtfully create your vision! Located in Shelburne right near Burlington, In Full Bloom exceeds expectations for countless weddings in Vermont with their unique, avant garde designs and personal service. 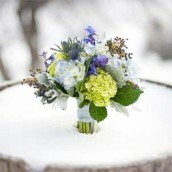 In Full Bloom is ready to work with you to provide the most unforgettable wedding flowers in Vermont! Also a Vermont Association of Wedding Planners member. From zen simplicity to lavish elegance, Alison’s unique designs will suit your individual taste and style. 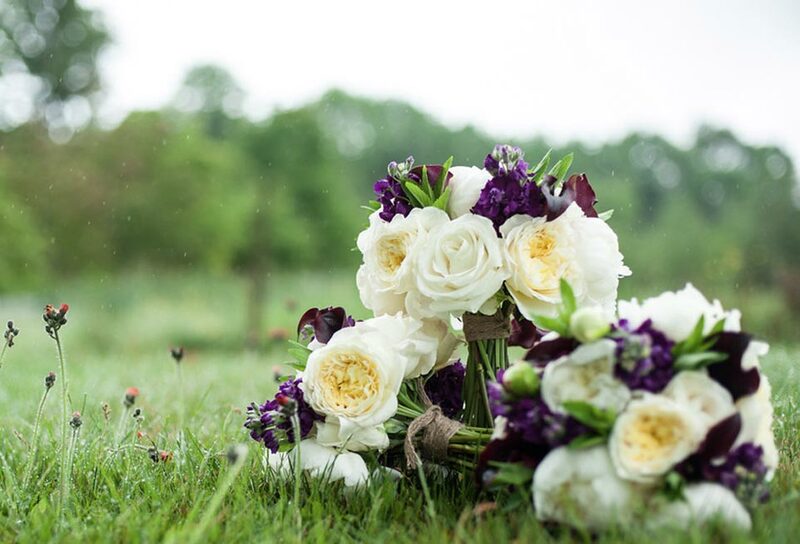 Specializing in weddings, Allison believes that the true art of floral design can be found through high quality flowers and superior design technique. She provides attention to detail in every facet of design, from presentation to delivery, and is committed to every one of her events. Alison supports local, organic growers and Vermont-owned businesses. In our opinion, Alison is a delight! Make a list of the formal shots you must have from your wedding day. This is not a list of family members, but the list of the type of shot. For example, if you would like to have a full-length shot in your full wedding day attire, your photographer will know this from the list that you have prepared in advance. Family shots should be done before the ceremony. Couples can take pictures individually with parents, siblings, and wedding attendants before guests arrive. One of our favorite things is “First Look”. It is when the couple see each other for the first time, alone, in a secluded spot. It is a beautiful, intimate moment shared in a scenic spot on our property. This is a fantastic way to capture that first special moment, and it gets some photographs out of the way so you can better enjoy your ceremony together. Lastly, allow enough time after the ceremony and before photos to take time for yourselves - fifteen minutes or so. We find that it is important for couples to have private time before the ceremony. Photographers Brian Mohr and Emily Johnson approach most weddings as a team, and they are especially fun and easygoing to work with. They connect with you to best understand your photo-related wishes and arrive at a simple photo plan for the day, so that the photography flows easily and without a hitch on wedding day. Their work is widely published, prioritizes natural light, and it reflects their intimate connection to the Vermont outdoor landscape. Brian and Emily are happily married with two beautiful daughters, and share a love for capturing the beauty, energy, details and emotions so unique to wedding celebrations. Meg's work has been described as: crisp, bright, clean, happy & inspired by the love and emotion of my subjects. Meg offers a true blend of traditional & journalist styles for all of clients. This ensures that the full scope of your wedding day story is told after the fact. Kathleen says: "I love what I do because I receive such joy in working with people and witnessing the bond between them. It is magical, the moments I get to observe and capture. From true love to true happiness. Magical." It is Adam’s goal to create artistic, emotional and super fun images of your wedding day that you'll cherish for a lifetime. He creates images and albums that will undoubtedly become your family heirlooms. He will tune his approach to your liking to tell your unique love story. A fresh, creative approach to wedding photography and videography. Micah and Kelly Dudash produce creative movies and photographs for the lovers. Their wedding vision is truly unique. Guided by their artistic backgrounds, they provide photographs and films that are described as earthy, sensitive and ethereal. They do most of their work in Vermont, and their style is infused with its alluring beauty. Their work results in imagery that genuinely and imaginatively retells each couple's unique love story. Birke Photography is a wedding collective specializing in photography and video production. We are artists and storytellers with an eye for capturing the depth and honesty of a fleeting moment. Our style is bold and unobtrusive. We work with natural light to create beautiful, timeless images. Andu Duback and his team make a simple promise to every couple: that nobody will work harder to capture the beautiful, unscripted, wild emotional ride that is their wedding.ring the depth and honesty of a fleeting moment. With a background in photojournalism, he loves being close to the action, allowing his couples to fully experience their wedding while knowing they'll be able to relive those moments in rich detail. Based near Brattleboro, VT, Dreamlove Photography creates documentary images to tell the true story of your wedding day. They specialize in rustic outdoor weddings with an ethereal style. All packages include two photographers and a thumb drive of individually toned full resolution images in both color and black and white. Wedding photography for Vermont, New England and beyond. Sabin Gratz focuses on building a strong relationship with couples in order to create images that are natural, one-of-a-kind, and representative of the experiences of the wedding day. They believe that the best wedding pictures come from moments without posing or planning. They have spent many years watching and waiting for those moments to surface, and have developed the skills to transform them into beautiful pictures. Daria Bishop Photographers are Daria and Andy Bishop, a happily married team who specialize in exceptional wedding photography. They realize that each wedding is as unique as you are, so they approach each wedding with a fresh perspective. They capture the love, romance, people, emotion and details (which you’ve worked so hard to bring together) to tell the story of your amazing day. Their distinctive and award-winning style combines real moments with the magic of your wedding so you can remember and cherish your celebration for years to come. Using a quiet journalistic approach, Corey Hendrickson creates photographs that are elegant, natural, and unique. His patience and attention to detail ensure consistent results, from formal portraits to candid moments. Corey works with digital capture, allowing for simultaneous color and black and white photographs. Online proofing is provided for all events. Hair, Make Up and More! For a special celebration weekend treat… here are a few folks we recommend! The Afterglow staff prides itself in extensive knowledge & experience in the wedding and special occasion industry. Michelle has 16 years of experience, and has been chosen to participate in several wedding & fashion shows. In 2007, she did the hair for the Vermont Vows Wedding Show, and the following year did the cover on a popular Vermont wedding magazine. The team at Afterglow prides itself in continuing our education through shows & classes that are country wide so that we can provide you with cutting edge services. On location service. Ria is a true professional. Her motto is live beautifully, live happily! We love having Ria at the Round Barn Farm. As Central Vermont's headquarters for the Bare Escentuals makeup line - the original 100% pure mineral makeup since 1974 - you're in good hands. Our staff also comes highly recommended by NaturallyCurly.com for their expertise in styling and taming curly hair. You can visit their salon on your wedding day, or they will come to the Round Barn. Kerry Armstrong ~ Hair Stylist ~ www.kerryarmstrongvt.com Kerry is a very talented hairstylist, with a passion for weddings. Whether you have a specific style in mind, or are undecided, Kerry can help you create a style that works perfectly for you. She is located in VT and will travel to the Round Barn for day of styling. Jamie Dragon, Miss Vermont USA 2012, opened Lush Salon and Boutique in 2011, the same week she was crowned. Expanding her education for the love of the trade Jamie worked in several salons in Vermont as well as traveling to perform on location hair and makeup services for weddings and photo shoots. Listening very closely to the needs of her clients, she strives to produce perfection every client will be satisfied with. She takes her work beyond just giving a hairstyle; her salon focuses on empowering women and enabling them to feel confident in their own skin. We love the ‘glamour’ she brings to the Round Barn! A quick in, quick out, no fuss $43.00 manicure and pedicure kind of place! About 20 minutes away in Waterbury, heading towards Stowe. A delightful site by babbling brook, restful rooms and aromatherapy combine to ease your day of wedding jitters. Indulge yourself with a little shopping therapy in our boutique. They extend a $10.00 discount to the happy couple and free aromatherapy to the celebration party. Jennifer specializes in bringing a creative edge to classic style. 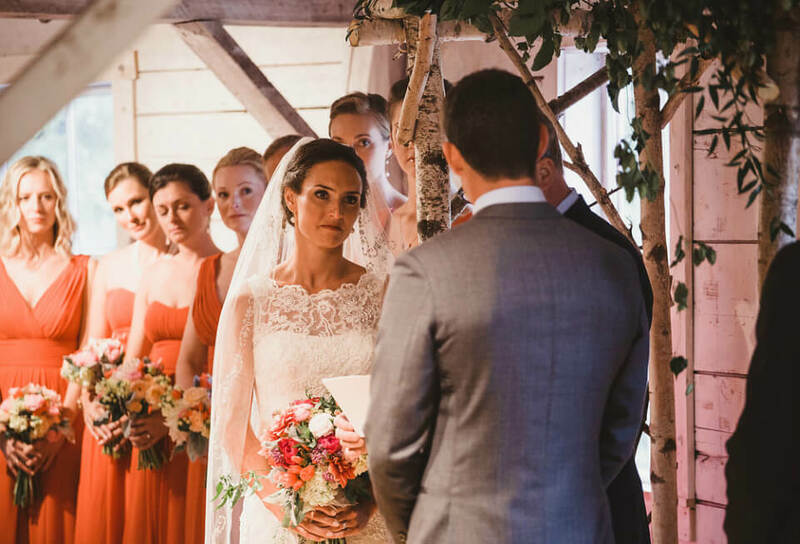 As one of Vermont's most sought-after freelance makeup artists, she offers years of experience working with brides and wedding parties. Jennifer's approach is simply learning about you and your expectations. She understands that each bride has her own vision and will take great effort in listening to what you want and need. Educated and experienced in both photo-friendly and long lasting makeup and makeup primers she will explore and plan with you the perfect look, feel, and style that you want to achieve on your special day. Justice of the Peace are elected officials who may change yearly. You may also use Justices from other towns. Call the local town clerk's office for current listings: Waitsfield, 496.2218; Warren, 496.2709; Fayston, 496.2545; Duxbury, 244.6660. St. Patrick's Catholic Church 802.244.7734 Quaint, old-fashioned white church in Moretown Village. It is quite small so take a look. 15 minutes away. Our Lady of the Snows Catholic Church -802.244.7734 More modern in architecture, located on Route 100 in Waitsfield. Has a large open space. 10 minutes away. Waitsfield United Church of Christ - 802.496.3065 Located in Waitsfield Village, just through the covered bridge. Very simple with great acoustics. Classic New England Church. 5 minutes away. Warren United Church - 802.496.2713 Warren's historic town church with Minister Susan McKnight. Elegant white clapboard church with a lovely stone stairway. 10 minutes away. We have calligraphy table numbers with metal holders available for your use. If you would like to provide your own, please feel free. Another idea is to forgo the number system and have table names. For example, one clever couple made table names relating to all of the places that they had lived and from which their guests had traveled. In addition, they scrambled and searched through the family albums and got photos of themselves, family and guests and put them on the table cards. These were passed from table to table and were a sentimental highlight of the wedding reception. Other themes have been favorite ski or hiking trails, mountains, favorite books, scrabble tiles, or even photos of the couple at different places or their school pictures. We are always concerned about children’s safety while here on the grounds. If you will have more than four children under the age of eight at your reception, please hire a babysitter. We know that kids love to explore our ponds and other intriguing areas of the farm, but when unsupervised this could become dangerous. Hiring a babysitter will also allow parents to enjoy a more relaxing time! We are happy to arrange this for you; just let us know. Wedding favors have become a tradition of the past: nobody seems to want almonds in netting anymore. Have fun with your wedding favors and tie in a Vermont theme! There are many crafty items to be found in the Valley, such as novelty containers of maple syrup that can be placed at each setting or tied to a place card. Many of the Vermont chocolate companies can custom label boxes with a wedding logo for you, with their fine quality chocolates inside. A variation on the guest book theme and a signature piece of Round Barn art, a Wedding Art Guest Book makes a wonderful keepsake! You can purchase one right here at the Inn. Frames come in two sizes, and come in luscious maple or cherry wood. If you would like to purchase one, Just let Lisa or Steph know. 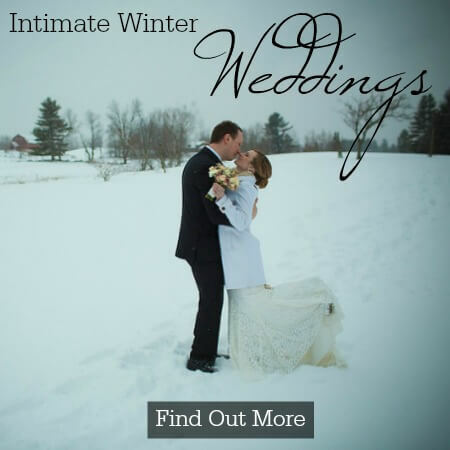 View our Vermont wedding venues with indoor and outdoor wedding options.